Imageotag creates Google Earth Tour kml and kmz files with image sequences, audio and GPS location details. 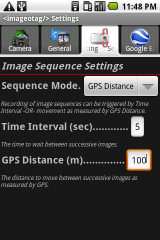 Recording of image sequences can be triggered by Time Interval -OR- movement as measured by GPS Distance. 1. 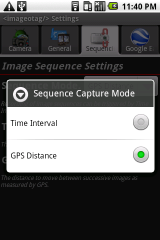 Set Time Interval or GPS capture mode in the Sequence Settings. 2. Set Time Interval in seconds or GPS Distance in meters in the Sequence Settings. 3. Mount the device firmly and securely in a suitable position prior to beginning the image sequence capture. 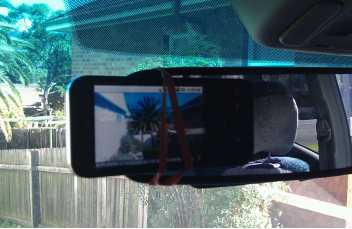 For example, to the rear view mirror in a car, on a motorcycle or bicycle, or attached to a helmet. 4. In the Camera Preview, wait until the GPS has a location fix, indicated when the GPS icon in the status blind stops blinking. 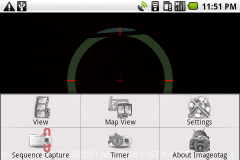 Press the menu button in the Camera Preview and touch Sequence Capture to start capturing the sequence images. Successive photos will be taken each time the device moves the specified distance as measured by the GPS or the specified time interval elapses. A wake lock with screen dimmed is used to keep the device on while capturing the sequence images. Images will continue to be recorded until you again touch the Sequence Capture menu button again, or the device battery runs out or the SD card becomes full. 5. Once you have finished your journey, press the menu button in the Camera Preview and Touch Sequence Capture again to stop capturing images. 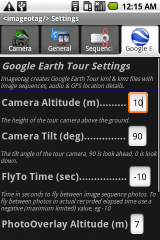 The Google Earth Tour .kml and .kmz will be automatically created from the Imagetag sequence images recorded. An Imageotag notification icon will be shown in the status blind while the .kml and .kmz file are being created. Opening the Imageotag notification will show the progress of the tour creation. Tour creation can take several or many minutes depending on the number of images recorded in the sequence. To view the the Google Earth Tour connect the device to a computer with the USB cable and mount the SD card, then navigate to the com.imageotag/kml folder and copy the .kmz file to your computer. Once copied double click on the .kmz file to view in Goole Earth on your computer. 6. You can also remake a Google Earth Tour again after changing any of the Google Earth Settings. For example after adding audio commentary to the sequence images from the Image View Menu. 7. Select Make Earth Tour from the menu of the selected Image Sequence list. 1. Imageotag Google Earth tours are created for both Time Interval or GPS movement image sequences. Time Interval sequences may have overlapping images during the Imageotag Google Earth tour when the camera was stationary for multiple images. 2. An Non Sequence Imageotag Google Earth tour can be created for the current list of photo images. Press Make Non Sequenec Tour from the Photos Image View menu. The photo images will be included in a tour that bounces from image to image within Google Earth. These non sequence images may overlapp in the Google Earth tour where many images were taken in the same location. This feature is only experimental and of limited use. 3. The kmz files created by Imageotag contain a copy of each image as well as any recorded audio and the kml tour file. Kmz files can be large, with hundred of megabytes, and use a lot of space on the device SD card. Be sure to do regular copies of these files to a computer and delete old kmz files in the com.imageotag/kml folder from the device SD card. 4. Kmz files are zip format files and can be opened with zip software on computers. Kml file are xml format files and can be opened with text editors. 5. Expert users can also edit the .kml (inside the) .kmz file to make further enhancements. An example might be to add a background music track to play throughout a tour. Refer to the Google Earth KML docs for further details. 6. With a recent update of Google Earth to Version 6, I have noticed that some imageotag images are shown upside down in Google Earth (!) I have raised a support request with Google to fix this issue ( which was not happening with previous version of Google Earth ). Imageotag Version 1.07 now provides a new Google Earth Setting - PhotoOverlay Roll (deg) set to 0 force all sequence photos to horizontal and right side up.